After 23 rounds of the regular season, only eight teams remain and over the next month will fight it out over the course of nine matches for the AFL’s ultimate prize – the premiership. A local derby, two grand final rematches from 2008 and 1998 and a sudden death elimination final between last year’s beaten grand finalists, the West Coast Eagles, and the Western Bulldogs, will highlight the first week of the finals series. 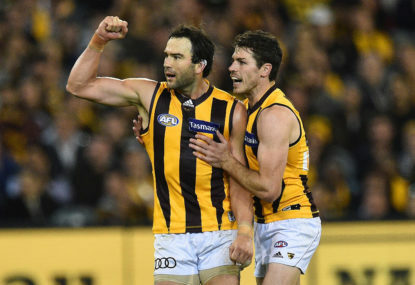 Hawthorn’s thrilling one-point win over Collingwood on Sunday locked in the above schedule, with the three-time reigning premiers to start their bid for a fourth straight flag in a blockbuster qualifying final against the Geelong Cats. It will be their fifth meeting in a final in the last decade, with the Hawks winning three of the past four finals meetings in this period, including the 2008 grand final. The Cats’ only win came in this exact same fixture in the 2011 qualifying final. As a matter of fact, the winner has gone on to win the premiership, with the Cats’ most recent flag coming in 2011 and the Hawks’ victories coming in 2013 and 2014, on top of its 2008 flag. Thus, you could confidently bet that the winner of this qualifying final goes on to win it all on October 1. The only final to be played in Melbourne in the first week will also mark another chapter in the famous rivalry between the two sides, and will be just their second meeting for the season after previously facing off in Round 1. Back then, Patrick Dangerfield marked his Geelong debut with a stunning masterclass, tallying 43 disposals and taking a contender for mark of the year as the Cats won by 30 points. Now, he will face the Hawks in a final for the second consecutive year and he’ll want to make this a much better affair after his last game in Adelaide Crows colours ended in a semi-final loss to the eventual three-time premiers at the MCG. The other qualifying final stands to be, potentially, the biggest AFL match ever played in New South Wales, with the Sydney Swans to face intracity rivals the GWS Giants in the other qualifying final at ANZ Stadium. There have been some massive matches in Sydney since the Swans relocated from South Melbourne in 1982, such as the 1996 preliminary final, in which Tony Lockett kicked the match-winning point after the final siren, and the 2005 semi-final, in which Nick Davis kicked the match-winning goal with merely seconds left. But none will be bigger than the first qualifying final between the Swans and Giants at ANZ Stadium, which will also double as the debut finals appearance of the latter team. In a sense, the Giants’ rise from a bunch of inexperienced kids to finals debutants will come full circle, as their very first match in the AFL came against the Swans at ANZ Stadium on March 24, 2012. The AFL had said during the week that any Swans finals would be played at the Sydney Cricket Ground, except that if it was against the Giants, it would be played at the larger Olympic venue, where the Swans haven’t played since last year’s semi-final loss to North Melbourne, due to the potential for a large crowd. Right on cue – we now have a Sydney Derby in the first week of the finals. The prospect of an all-Sydney qualifying final appeared improbable at the start of Round 23, but the West Coast Eagles’ upset victory over the Adelaide Crows on Friday night opened the door for the Giants to sneak back into the top four. That was reliant on the Giants beating North Melbourne at Etihad Stadium on Saturday night, which they did three hours after the Swans locked up the minor premiership by thrashing Richmond by 113 points at the SCG. By this point, the Sydney Derby final wasn’t set in stone yet – Hawthorn simply had to beat Collingwood to claim third place on the ladder and thus “relegate” the Giants to fourth on the ladder and a “home” qualifying final against the Swans. As noted above, the Hawks got up by a solitary point, meaning they overtook the Giants on the ladder. If they had lost, the Giants would’ve finished third but would’ve had to face the Geelong Cats in a qualifying final at the MCG. And so, the AFL’s dream of an all-Sydney Derby final, and to some extent, Eddie McGuire’s worst nightmare, has come true. The fact that the match is at ANZ Stadium will indirectly give the Giants the advantage, as the ground is located within Sydney’s Olympic Park precinct, which is also where the club’s training base is located. However, they have not played at the Olympic Stadium since Round 1, 2013, and have lost all three matches it has contested at the venue. By contrast, the Swans have played ten finals at its former part-time home ground, for eight wins. It will also remain to be seen how the Giants handle the September pressure cooker for the first time against their bigger brothers, who by contrast will be contesting their 18th finals series dating back to 1996. That’s more than any other team in the same period. This match-up appears very evenly poised, with the Swans winning at the SCG by 25 points in Round 3 and GWS returning serve with a 42-point win at Spotless Stadium in Round 12. Amazingly, the third meeting between the two clubs this year will take place at a third venue, and if they meet in the decider on October 1, the MCG would play host to the first-ever local derby grand final. The two elimination finals will be played outside of Victoria; coupled with the qualifying final in Sydney, it means that, for the first time since 2004, there will be only one final in Melbourne in the first week of the finals series. Given there will be one final in Sydney in each of the second and third weeks, it means Melbourne will host a grand total of just four matches – the grand final included – this finals series, as was also the case last year. Since 2000, only twice previously (in 2003 and 2006) has Melbourne hosted less matches in a single finals series. In both years they hosted just three matches, including the big one. The Adelaide Crows had entered Round 23 in second place on the ladder, and with a chance to all but secure a top-two finish, but their 29-point loss to the West Coast Eagles, coupled with other results going against them, saw them drop to fifth, meaning they will host an elimination final against North Melbourne. Had Jack Fitzpatrick not kicked a match-turning goal for Hawthorn against Collingwood on Sunday, the Crows would’ve kept their double chance but they would’ve had to travel to Sydney for a qualifying final date against the Swans. Instead, they will face sudden death when they welcome the Kangaroos to what will be the Adelaide Oval’s second final, after Port Adelaide hosted Richmond at the venue in 2014. In the Crows’ favour, however, is that they won their only previous finals match against North Melbourne, in the 1998 grand final, and haven’t lost to them at home since Round 21, 2003. They’ll also get Rory Sloane and Brodie Smith back after the pair were severely missed against the Eagles. For the Roos, they face the prospect of having its finals series ended with yet another interstate loss, following defeats in 2007 (Adelaide), 2008 (Sydney), 2012 (Perth), and each of the past two years (Sydney and Perth). In fact, if it manages to repeat its efforts of the past two years in reaching the preliminary final from outside the top four, it won’t play at the MCG until week three, because if they beat the Crows they’ll travel to Sydney to face either the Swans or the Giants in a semi-final. The two meetings between the Crows and Roos this season were split, with the Roos winning by ten points at Etihad Stadium in Round 1 and the Crows returning serve with a 33-point win at the Oval in Round 14. The other first-week sudden death final will kick off the finals series, with the West Coast Eagles to host the Western Bulldogs at Domain Stadium in the AFL’s first ever Thursday night final on September 8. The Eagles’ 29-point win over the Adelaide Crows earned them a home final in some capacity, while the Bulldogs were guaranteed to finish seventh regardless of how they fared against Fremantle in Perth (they lost by 20 points). It means Luke Beveridge’s men will have to make another long trip west in less than a fortnight’s time to face the Eagles in a final for the first time since 2006. Had it not been for the establishment of the new pre-finals bye when the fixture was released last October, chances are this match would’ve been played on the Sunday so as to give the Bulldogs a full week’s break. Still, an 11-day break will be enough for the players to rest, recover and train in Melbourne before they embark on their second consecutive finals series, which again has been achieved in the face of yet another horrific injury toll. It will remain to be seen whether Jake Stringer, who has missed the past two matches after being dropped to the VFL, will be recalled, while Easton Wood should return from an ankle injury suffered against Collingwood in Round 21. Meanwhile, the Eagles will enter their second consecutive finals campaign under Adam Simpson in very good nick, having won their last four matches in a row, the last three of them against quality opposition in the GWS Giants, Hawthorn and, most impressively, the Adelaide Crows at the Oval. The win over the Crows, in which they controlled the match from start to finish, was achieved with journeyman Johnathan Giles combining very well with Scott Lycett in the ruck in the wake of the ACL injury suffered by Nic Naitanui against the Hawks. Giles, who formerly played for the Giants and Essendon before crossing to the Eagles last year, was recruited by the club for a reason – to provide cover-up should the worst occur to either Naitanui or Lycett, which has in the former’s case. Thus, while Naitanui sits out most, if not all, of next season, Eagles fans should expect to see more of Giles in action in 2017. The only meeting between the two clubs saw the Bulldogs emerge eight-point winners at Etihad Stadium in Round 11, when Marcus Bontempelli became the youngest man in AFL history to captain his side to a win. However, the most recent final between the two clubs saw the Eagles win by 74 points en route to winning its third (and to date most recent) premiership flag, a decade ago. And so, the stage is set for what should be an exciting finals series, and there will be so many questions to be asked in the upcoming month ahead. 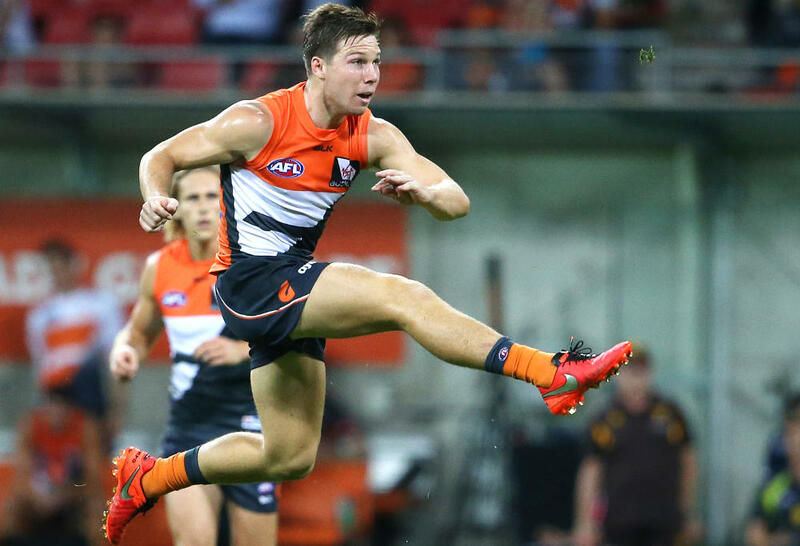 How will the GWS Giants fare under the September pressure cooker? Can Hawthorn make it a four-peat? And can Patrick Dangerfield inspire the Cats to their first premiership since 2011? But most importantly, what effect will the new pre-finals bye have on all four teams? All that is set to be answered when the finals get underway on Thursday, September 8. All starting times are local.